Lenovo is working on a 23-inch tablet, with William Cai telling TechRadar that the company believes a home tablet could be arriving this year. Speaking at this year's Gadget Show Live, Cai – senior specialist in marketing for the company – talked about the problem with multiple screens in the home. He expressed his belief that a tablet that could be moved from room to room and used on tables as well as docked as an All-in-One could be an elegant answer. 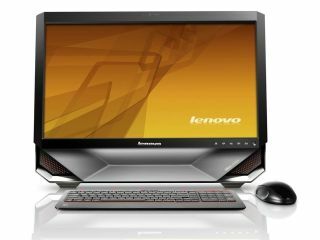 And, before you wonder if this is all in the realm of research and design, Cai told us that a tablet based on the company's All-in-One desktop range, but with a major weight reduction, will be arriving in 2011. "We think that there is potential for a 23-inch tablet," said Cai. "We'd have to take care of battery life and we are working to get the weight down. "It's obviously not for full mobility use, but it could be moved from room to room in the house and used with a full keyboard, or as a television.Or you could lay it on a table top and use it for family games. "We're hoping that we can launch it later this year." So could you find a use for a 23-inch semi-portable tablet/All in One hybrid? We'd certainly give it a go before passing judgement.